VTOL stands for Vertical Take-Off and Landing, a moniker used to refer to airplanes which can take-off and land like a helicopter. 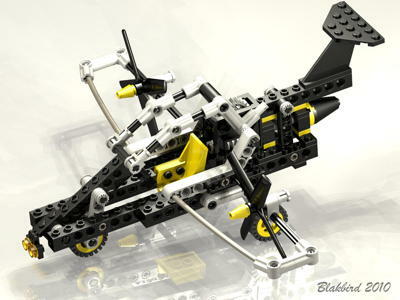 This ability has been a dream of aviation engineers since the dawn of powered flight but has proved elusive to achieve. 8222 attempts this difficult feat by means of a tiltwing, a feature that has been tried experimentally but never used in a production aircraft. On the other hand, tiltrotors are used in the Bell-Boeing V-22 Osprey which was very likely the inspiration for this model despite the differences, and was certainly the inspiration for the later 8434. Those two models remain the only vertical take-off airplanes in the Technic stable. This particular aircraft tilts the whole wing with a worm gear. 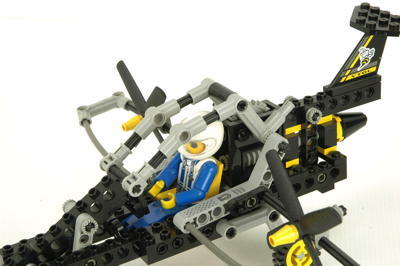 The props are not geared to anything but can spin, and the canopy can open manually. 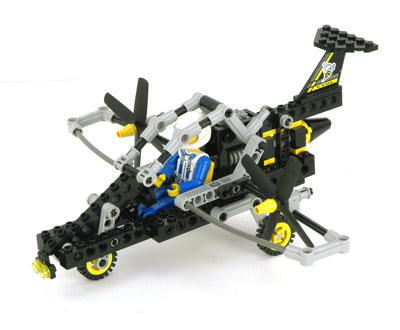 This a single place aircraft and comes complete with a pilot. The wing leading edge is made from flexible tubing. The canopy uses the new angled connectors. A detailed sticker is used for instruments in the cockpit. 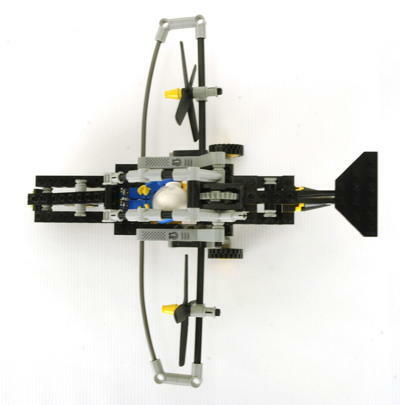 The wings of this model are quite fragile due to the fact that the tips are only connected to the root by an axle, and the two sides of the wing are only connected together at the tilt axis. 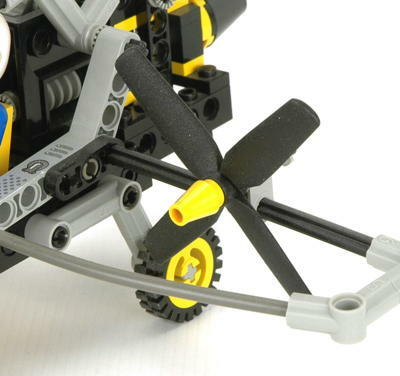 The twin 4-blade props are not connected to each other or driven by anything, but they can be spun manually on their axles. 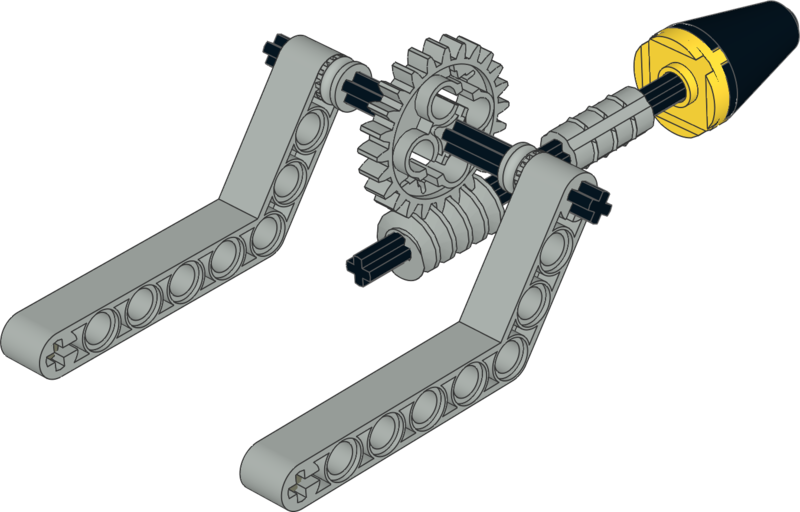 The animation shows counter rotation of the props which seems appropriate for an aircraft like this, but technically one side would need to have reversed pitch on the blades for this to work. 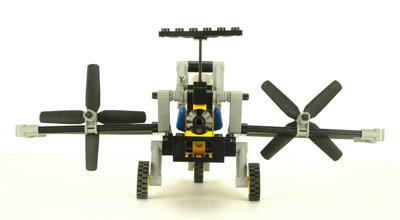 Click for an animation of the propellers in motion. A canopy made from angled connectors can be opened manually. There is a handy thumb lever behind the pilot's head to assist in opening. 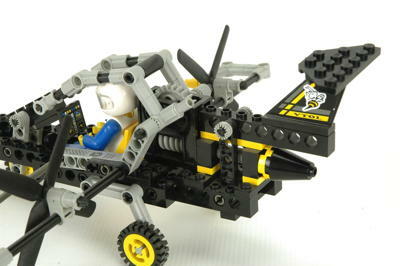 The entire wing including the engines can be rotated around an axis behind the pilot's head using a knob in the back driving a worm gear. 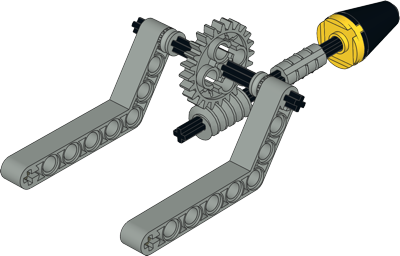 The worm gear whose use assures that the wing will hold any position is housed in a dedicated gearbox element. The knob is geared down 24:1 with respect to the wing. Click for an animation of the wing tilt in motion. 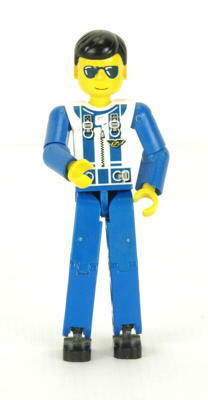 This pilot is wearing a blue and white flight suit. His seat belts remain oddly attached to his body even when is out of the aircraft. 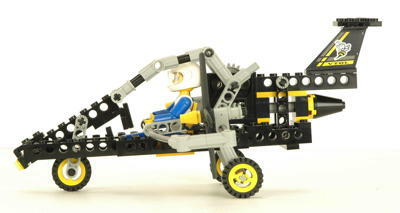 This is the same figure as in 8232 except for the color of the helmet. They do not appear anywhere else. 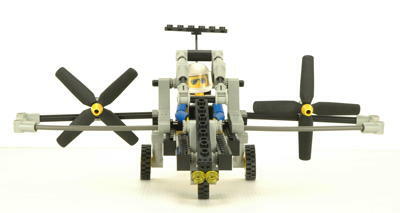 His aircraft appears to be experimental and not very well designed, so he is expected to have a short life span. 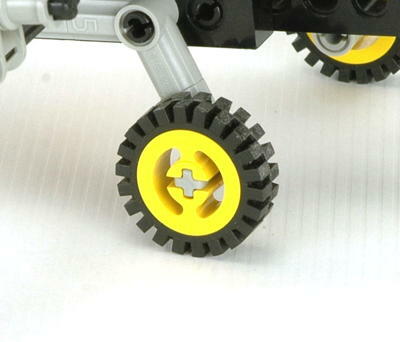 The tricycle landing gear uses old style pulleys and tires. The struts are made from angle connectors.